Sustav gospodarske proizvodnje i ekološki čimbenici, poglavito držanje i prehrana životinja imaju znatan utjecaj na njihovo zdravlje. Stoga je glavni cilj rada procijeniti utjecaj dvaju različitih sustava gospodarske proizvodnje mliječnih krava na proizvodnju i kvalitetu mlijeka. Isto tako, unutar svakog uzgojnog pristupa razmotreni su utjecaj sezone i laktacije na proizvodnju i kvalitetu mlijeka te time procjena zdravlja stada. U istraživanje su uključene dvije farme mliječnih goveda koje imaju različiti uzgojni sustav: stajski i stajsko-pašni. Podatci su obrađeni u razdoblju od siječnja do prosinca 2011. godine. Proizvodnja i kakvoća mlijeka je procijenjena na temelju sljedećih parametara: dnevna količina mlijeka, udio mliječne masti, bjelančevina, laktoze, suhe tvari, broj somatskih stanica te indeksu masti i bjelančevina i količini ureje u mlijeku. Goveda koja se uzgajaju u stajsko-pašnom sustavu (Farma 1) tijekom cijele godine davali su značajnije veću količinu mlijeka od krava koje su držane samo u staji tijekom cijele godine (Farma 2). Prinos mlijeka bio je najveći u ljetnim mjesecima, a najmanji u jesenskom razdoblju. Udio mliječne masti, bjelančevina i suhe tvari bio je veći kad je proizvodnja mlijeka bila manja, tj. u jesen, a manji pri većoj proizvodnji mlijeka u ljetnim mjesecima. Kod stajskog načina držanja dnevna proizvodnja mlijeka bila je obrnuta u odnosu na stajsko-pašni način držanja, tj. veća u jesenskim mjesecima, a najmanja u ljetnom razdoblju. Udio mliječne masti i bjelančevina isto je tako bio najmanji tijekom ljeta, kada je bila i najmanja proizvodnja mlijeka u odnosu na ostali dio godine. Značajne razlike u uzgojnim sustavima vidljive su u koncentraciji ureje u mlijeku. Kod stajsko-pašnog držanja količina ureje u proljetnim i ljetnim mjesecima, tj. u vrijeme paše bila je i najviša i kretala se u granicama normalnih vrijednosti koje su, nakon pašne sezone već u jesenskim mjesecima pale za 2,5 puta. Kod stajskog načina držanja nije ustanovljeno jako odstupanje u koncentraciji ureje. Temeljem rezultata istraživanja može se zaključiti da je za procjenu zdravlja stada kao i za održivost zdravlja i dobrobit životinja nužno redovito pratiti metaboličke pokazatelje u cilju kontrole i procjene zdravlja životinja za sve životinje na razini stada i farme kako bi se na vrijeme mogle spriječiti pojave subkliničkih stanja, a time spriječiti i teže posljedice za životinju i vlasnika. Dairy production is an important segment in Croatia’s agriculture industry, accounting for more than 8.96% of the overall agricultural production (Oplanić et al., 2008). According to the official data of the Croatian Bureau of Statistics (Anonymous, 2006), there were 488,646 head of cattle in Croatia in 2003, mostly on family farms (81.46%). In Bjelovar-Bilogorje County, there were 72,413 head of cattle (14.82% of total cattle), the majority on family farms (62,550 head of cattle or 86.38% on 8,253 farms), predominantly with dairy cows (95.68%). Only 24 of these family farms (0.31%) had more than 20 cows. According to Njavro et al. (2009), the average income per cow is HRK 15,918.46. In cattle production, environment plays a very important role and therefore milk production and milk quality can be influenced by the relationship between the animal and external factors, such as different housing systems and diet (Caput, 1996; Bačić, 2009). Adequate housing and a balanced diet can prevent the occurrence of nutritional and metabolic disorders, and can increase production with the consequent positive and desirable economic impacts on a farm (Berman et al., 1985; Whitaker et al., 2000; McNamara et al., 2003; Juchem et al., 2004; Bačić et al., 2007). Metabolic disorders can be detected on time with the regular monitoring of milk quality, which is determined by measurements of biochemical values in milk. In Croatia, the I.C.A.R. method, namely A4, is used to monitor milk quality. This method includes measurements of daily production every four weeks during lactation, with intervals between measurements of no longer than 33 days (Caput, 1996). 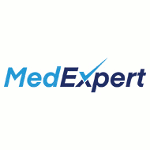 Such monitoring enables the timely detection of environment-related risk factors and prevention of diseases related to an unbalanced diet, such as ketosis, flatulence, birth paresis and hypomagnesaemia. On the other hand, some types of feed, their composition, form and consistency can significantly influence milk composition, particularly the ratio of fat and proteins. The fat content in milk decreases with the increased use of concentrate in feed. Correlations have been confirmed between the quantity of silage, especially crude fibre, the C2:C3 ratio in the rumen, and in the acid to fat ratio in milk. A highly concentrated, low-forage diet may lower the pH in the kidneys, decreasing the content of cellulytic bacteria. Such a diet causes lower lactation efficiency and lower milk fat production, shifting energy metabolism towards synthesis in the body tissues rather than to milk synthesis (Caput, 1996). The growing awareness of the importance of sustainable milk production with lower production costs has resulted in the demand for a preventive approach and the need for permanent monitoring of milk production. The monitoring of biochemical values in milk is a requirement for mammary gland health and herd health in general, thereby ensuring long-term milk quality. Biochemical values (such as fat content, proteins, lactose and dry fat matter, index of fat and proteins, and urea concentration) in milk can indicate pathologic processes, and their timely detection is essential for maintaining an economically efficient farm. 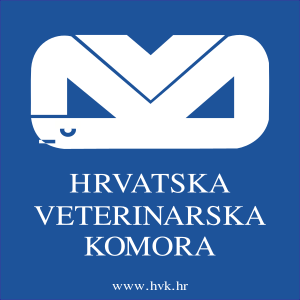 The aim of this study was to compare milk production and biochemical values of milk in dairy cattle kept in pasture-confinement and confinement-only management systems, and to analyse the influence of climate on the quality and quantity of milk production in the pasture-confinement management system in northwestern Croatia. This study compared milk production on two dairy farms in northwest Croatia with different management systems: pasture-confinement (Farm 1) and confinement-only (Farm 2). Data were collected over a one-year period, from January to December. At Farm 1, during the warm months, 58 Simmental cows are kept in a fenced pasture with a small shelter and feeders. In winter, cows are housed in a barn and bound by a vertical Grabner type system. The barn is a concrete structure with a wooden roof, short stalls and concrete floor without rubber mat flooring. There are automatic watering devices in the barn. The building is ventilated naturally. In the winter the indoor temperature is several degrees higher than the outside temperature. The animals are fed with hay, silage and concentrates at the feeding table. At Farm 2, 64 Simmental cows are kept year-round in a free stall slaed-floor barn. There are concrete stalls at the back of the barn and automatic watering devices. The building is ventilated naturally. Cows are fed with silage and concentrates at the feeding table. Daily milk yield (kg), milk fat content (%), protein (%), lactose (%), fat-free dry matter (%), fat and protein index, amount of urea (mg/100 mL) and somatic cells (cells/mL of milk) were determined and analysed. Statistica 8.0 and Excel 2002 programs were used for data analysis. Differences were analysed using the T-test for dependent and independent samples. Statistically significant differences were determined at P < 0.05. The average milk production for both farms is presented in Tables 1 and 2. The average daily milk production per cow was 18.67 ± 7.77 kg on Farm 1, and 15.29 ± 4.49 kg (P < 0.05) on Farm 2. Table 1. Seasonal indicators of milk quantity and quality for Farm 1. Fig. 1. Daily milk production by month on Farm 1 and Farm 2. Figure 1 shows that the average daily milk production per month was higher on Farm 1. The data for Farm 1 show seasonal changes of milk production, ranging from the lowest in autumn (17.16 ± 5.16 kg) to the highest in summer (19.97 ± 7.40 kg) (P < 0.05). The annual mean fat content was 4.11 ± 0.77%, and was highest in autumn and winter. Seasonal variations of milk fat content were statistically significant (P < 0.05). The average protein content was 3.67 ± 0.61%, and was highest in autumn and winter. Significant differences were recorded between summer protein content and the rest of the year, and in spring vs. winter protein content. The average index of fat and protein (1.14 ± 0.2) was significantly higher in summer (1.19 ± 0.19) than in other seasons. No significant seasonal variations in lactose values were observed (average annual value of 4.45 ± 0.21). The annual mean content of non-fat dry matter was 8.97 ± 0.58%, and was highest during the autumn and winter (P < 0.01) (Table 1). A very low urea concentration in milk was observed in autumn (6.76 ± 3.80 g/100 mL) and winter (10.00 ± 5.82 g/100 mL), while values were 2.5 times higher (P < 0.01) (Table 1) in spring and summer. Table 2. Seasonal indicators of milk quantity and quality for Farm 2. Table 2 shows the milk production data on Farm 2, with production lowest in summer (14.70 ± 1.78 kg) and highest in autumn (15.74 ± 4.53 kg). Differences in milk production during autumn and winter were statistically significant (P < 0.05). The annual average milk fat content was 4.26 ± 0.88%, and was lowest in winter (P < 0.05). The average protein content was 3.41±0.45% ranging from 3.32 ± 0.46 in summer to 3.60 ± 0.35 in winter (P < 0.05). The highest protein content (3.60 ± 0.35%) was observed in winter (P < 0.05). The fat and protein index was on average 1.26 ± 0.26. Values were lowest in spring (1.19 ± 0.18) and highest in winter (1.33 ± 0.22) (P < 0.05). The winter value was significantly higher than in other seasons (P < 0.05). The annual average lactose percentage was 4.52 ± 0.19. Seasonal variations ranged from 4.49 ± 0.18 (summer) to 4.55 ± 0.21 (autumn) (P < 0.05). The highest values of non-fat dry matter were recorded in autumn (8.95 ± 0.58%). The annual average urea concentration was 12.95 ± 6.32 g/100 mL. Lower urea contents were observed in autumn and summer, while values were 1.36 times higher (P < 0.01) (Table 2) in spring and winter. Fig. 2. Indicators of milk fat and protein on Farm 1 and Farm 2. Fig. 3. Monthly values for non-fat dry matter on Farm 1 and Farm 2. As shown in Figure 2, there were no significant deviations of fat and protein contents during the year. The non-fat dry matter (Fig. 3) showed certain seasonal deviations, however these differences were within the normal range. Deviations were more pronounced on Farm 1, particularly between summer and winter months. 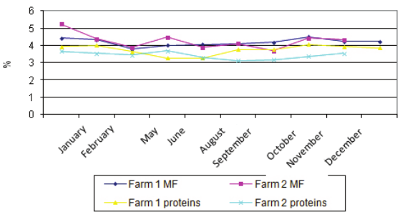 On Farm 1, the lowest amount of non-fat dry matter was in summer, which gradually increased to peak values in November. The milk produced on Farm 2 did not show such seasonal fluctuations in the quantity of non-fat dry matter, though some differences existed. Fig. 4. Urea concentration per month. Figure 4 shows the significant differences in urea concentrations in milk. On Farm 1, urea values were higher in spring and summer and achieved normal values, while the values on Farm 2 were below normal. During autumn, the urea concentration in cows on Farm 1 dropped significantly while it increased slightly on Farm 2. The average (geometric mean) somatic cell count on both farms was 400,000/mL which is within the normal limits according to the Regulation on fresh raw milk (OG 102/2006) (Fig. 5). Fig. 5. Comparison of somatic cell counts (geometric mean) on both farms during the year. Both herds had the same average somatic cell count. The average somatic cell count was 129,338/mL on Farm 1, and ranged from 84,262/mL in October to 186,825/mL in September. On Farm 2, the average somatic cell count was 119,731/mL, ranging from 68,603/mL in October to 413,137/mL in January. 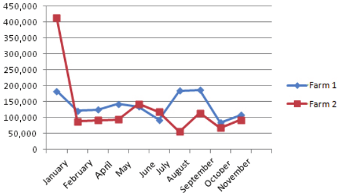 The average somatic cell count was generally lower on Farm 2, with the exception of January (Fig. 5). Fig. 6. Average daily milk production by lactation on Farm 1 and Farm 2. The average daily milk yield per cow was higher on Farm 1 (P < 0.05) (Fig. 6) during all lactation periods, except the third one. 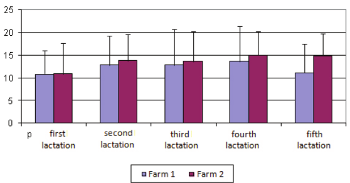 On Farm 2, daily milk yield per cow gradually increased up to the third lactation, and then gradually decreased in subsequent lactations. Daily milk production in the third lactation (18.67 ± 5.12 kg) in relation to the first (13.99 ± 2.72 kg), fourth (13.44 ± 4.18 kg) and fifth (12.95 ± 2.26 kg) lactation was statistically significant (P < 0.05). The fat and protein contents were within the normal values in all lactation periods, with similar values for both farms. Fig. 7. 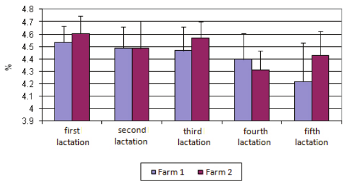 Fat and protein content by lactation on Farm 1 and Farm 2. Deviations in fat and protein values were more pronounced on Farm 2, but still within normal limits (Fig. 7). Lactose content in the milk in late lactation (Fig. 8) was considerably lower than in the first or second lactations. A decreasing trend in lactose content in subsequent lactations was recorded on both farms, though this was more significant on Farm 1. Fig. 8. Lactose content by lactation. On Farm 1, lactose content in the first lactation was 4.54 ± 0.13%, then gradually decreasing to 4.22 ± 0.31% in the fifth lactation. On Farm 2, lactose content in the first lactation was 4.60 ± 0.15%, thereafter gradually decreasing to the lowest values in the fourth (4.31 ± 0.15%) and fifth (4.43 ± 0.20%) lactations. Differences in lactose values between early and late lactation periods were statistically significant (P < 0.05). Fig. 9. Proportion of dry matter without fat and protein by lactation. On Farm 1, the values of dry matter without fat and protein (Fig. 9) were never lower than 8.5%, which is considered the minimal normal value. On Farm 2, the values of total dry matter without fat and protein in the fourth and fifth lactation were below the normal value. 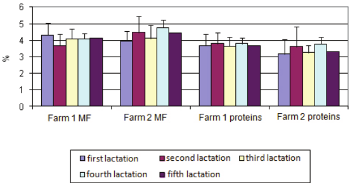 The difference in the values of dry matter without fat and protein in the fourth and fifth lactation at the two farms was significant (P < 0.05). Fig. 10. Urea values by lactation. As shown in Figure 10, the urea concentration per lactation was below the limits that indicate normal protein values in food (15-30 mg/100 mL) in both herds, except on Farm 2 during the fourth (15.00 ± 5.2 mg/mL) and fifth (14.86 ± 4.94 mg/100 mL) lactations. Keeping cattle in good condition, high-production rate and adequate welfare are priorities in dairy cattle breeding. In that task, monitoring of milk biochemical composition, namely protein and fat content and urea concentration, is significant for the detection and prevention of disease. The average daily milk production per cow shows that the grazing herd produced 3.38 kg more milk than the herd raised in a confinement-only system. The comparison of seasonal values of milk production clearly indicates that milk yield was higher in the grazing system throughout the year. The average milk production per cow in spring was higher by 3.2 kg in the grazing system, while in summer, autumn and winter it was higher by 5.27 kg, 1.42 kg and 3.34 kg, respectively (P < 0.05). Highest milk production during summer months (grazing period) indicates inadequate or improper nutrition during the time when the herd is housed in the barn. If the food were of the same quality throughout the year, the best result would be expected in winter (19.97 ± 7.40). On the other hand, housing of cows in the barn throughout the year showed the lowest milk production in summer, which can be explained by high temperatures and humidity as major factors that can have an inhibiting effect on milk production (Asaj, 1974; Itoh et al., 1998). According to Caput (1996), keeping animals in hot and humid stables where the temperature can exceed 23 °C can have an adverse effect on milk production. The effect of temperature on milk production has also been confirmed by Boaraoui et al. (2002) and Ravagnolo et al. (2000), showing that low temperatures cause decreased milk production. Slight temperature differences that can occur during spring and summer do not significantly affect milk production, as shown by Marenjak et al. (2006). Although the protein and fat content in milk produced on both farms was within the normal values, protein content in the grazing system was slightly higher while the fat content was slightly lower. At both farms, the highest content of milk fat and protein was recorded during the winter months, when milk production was lower. During the summer months, which had the highest average daily milk production, the average protein and fat contents were lower than the annual average by 0.24% and 0.06%, respectively (grazing system). Caput (1996) also found lower protein and fat with increasing production. If milk production is increased by 175 kg, fat and protein decrease by 0.03% and 0.02%, respectively. The drop in fat content during summer is explained by the temporary loss of saliva in the thermal regulation of the body. 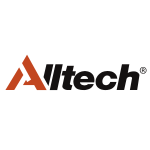 Less saliva in the rumen causes a lower pH, which leads to decreased production of acetic acid. The index of fats and proteins at both farms was within the normal values, indicating a balanced fat-to-protein ratio, as one of the main factors that indicate a uniform diet and suffi cient energy intake. The annual average value of non-fat dry matter in milk from cows in the grazing system was slightly higher than in the confinement-only system. Urea values within the normal range were observed during the spring and summer months in the milk of grazing cows, indicating sufficient protein intake by grazing on young spring pasture. In the confinement-only system, the concentration of urea was within acceptable values during spring, which can also be attributed to the high protein content of young grass silage. However, in this system, urea values decreased during the summer months. The marked decrease of urea concentrations in both farming systems indicate food insufficiency two to three months prior to the period when the low urea concentrations in milk were recorded. Through dietary correction and intake of protein-rich food, it can be expected that the fat-to-protein ratio will improve within two to three months. Differences in urea values (P < 0.05) between the two farms were also recorded during the winter months. The urea values in the grazing system remained low, while in the confinement-only system, they increased and reached normal values. The low urea concentration in autumn indicates decreased food intake during the hot summer period, which should be followed by recovery. However, if the values remain low for a longer period time, this indicates slow adaptation to the change in diet and feeding regimes, and indicates inadequate feed that is deficient in protein. The somatic cell count indicates the health of the mammary glands or the occurrence of subclinical mastitis. It is generally considered that cows with a somatic cell count less than 200,000 have no mammary gland infection (Bačić, 2009). The average number of somatic cells on both farms was less than 200,000. Seasonally, the highest average number of somatic cells was recorded in autumn in the grazing system and in winter in the confinement-only system. An increasing somatic cell count in milk decreases milk production. This study shows the negative correlation between the average daily milk production and the number of somatic cells (lower daily milk production and higher somatic cell counts in milk) at both farms. Pavlak et al. (2008) stating that the somatic cell count can be affected by season, but also by the age of the cow, lactation or other factors that might cause stress. The average daily milk yield per cow was reduced in subsequent lactations. There were no significant differences in milk production during the first and second lactations, which is consistent with the results of Marenjak et al. (2006). No variations in the amount of fat and protein in individual lactations were observed. However, Marenjak et al. (2006) found higher proportions of protein and fat in the second lactation. Lactose content decreased in subsequent lactations below the value of 4.5%, which indicates possible pathological conditions of the mammary gland that may occur in highly productive animals. The results of the analysis of two different dairy farming systems show significant differences in milk production and milk quality at the average annual and seasonal levels, as well as during each lactation. In order to evaluate the herd health status and the sustainability of the health and welfare of animals, regular monitoring of metabolic parameters, control of the diet and health evaluation of animals is necessary to enable timely prevention of the occurrence of subclinical conditions. 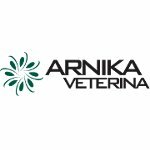 Therefore, the role of preventive veterinary medicine has become increasingly important in livestock production, including cattle breeding and milk production. 2. ASAJ, A. (1974): Zoo-hygienic in practice. Školska knjiga, Zagreb. (In Croatian). 3. 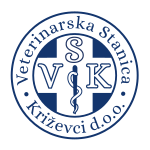 BAČIĆ, G., T. KARADJOLE, N. MAĆEŠIĆ and M. KARADJOLE (2007): A brief review of etiology and nutritional prevention of matebolic disorders in dairy cattle. 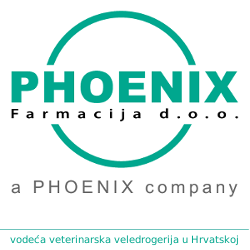 Vet. arhiv 77, 567-577. 4. 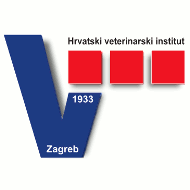 BAČIĆ, G. (2009): Diagnosis and treatment of mastitis in cattle. 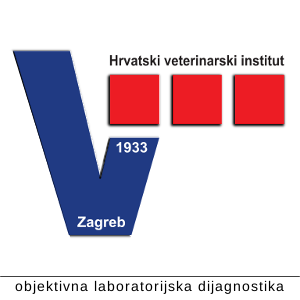 Faculty of Veterinary Medicine University of Zagreb. (In Croatian). 5. BERMAN, A, Y. FOLMAN, M. KAIM, M. MAMEN, Z. HERZ, D. WOLFENSON, A. ARIELI and Y. GRABER (1985): Upper critical temperatures and forced ventilation effects for high-yielding dairy cows in a subtropical climate. J. Dairy Sci. 68, 1488-1495. 6. BOURAOUI, R., M LAHMAR, A. MAJDOUB, M. DJEMALI and R. BELYEA (2002): The relationship of temperature-humidity index with milk production of dairy cows in a Mediterranean climate. Anim. Res. 51, 479-491. 7. CAPUT, P. (1996): Cattle breeding. Celeber, Zagreb. (In Croatian). 8. ITOH, F, Y. OBARA, M. T. ROSE and H. FUSE (1998): Heat influences on plasma insulin and glucagon in responses to secretogogues in non-lactating dairy cows. Domest. Anim. Endocrinol. 15, 499-510. 9. JUCHEM, S. O, F. A. P. SANTOS, H. IMAIZUMI, A. V. PIRES and E. C. BARNABE (2004): Production and blood parameters of Holstein cows treated prepartum with sodium Monensin or propylene glycol. J. Dairy Sci. 87, 680-689. 10. 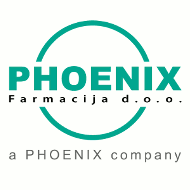 MARENJAK, T. S., N. POLJIČAK-MILAS and M. ZDELAR-TUK (2006): Auswirkungen von Fuerung und Klima auf Milchleistung und biochemisches Blut- und Milchprofil von Simmentaler Kuhen. Tierärztl. Umschau 61, 357-362. 11. McNAMARA, S, F. P. O. MARA, M. RATH and J. J. MURPHY (2003): Effects of different transition diets on dry matter intake, milk production, and milk composition in dairy cows. J. Dairy Sci. 86, 2397-2408. 12. 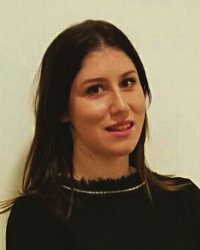 NJAVRO, M., L. HADELAN i O. KUMRIĆ (2009): Analiza konkurentnosti proizvodnje mlijeka-prikaz rezultata projekta “Croatia s EU Accession and Socio-Economic Implication for Farm Household”. Book of papers of 44. Croatian and 4. International symposium: Agroeconomcs and agrosociology, str. 227-231. (In Croatian). 13. Offical Gazette (2000): Pravilnik o kakvoći svježeg sirovog mlijeka. Narodne novine 102/2000. 14. OPLANIĆ, M., S. RADINOVIĆ, V. PAR i M. TRATNIK (2008): Ekonomska uspješnost uzgoja muznih krava na primjeru Istre. Agron. Glas. 70, 21-32. 15. PAVLAK, M., M. BENIĆ, D. CVITKOVIĆ i M. TADIĆ (2008): Epidemiološki podaci rasprostranjenosti mastitisa u goveda-analiza publiciranih podataka i usporedba s podacima pojave mastitisa u Hrvatskoj. Proceedings of International Scientific and Professional Congress of XVI Congress of Mediterranean federation for Health and Production of Ruminants (FeMeSPRum). 16. RAVAGNOLO, O., I. MISZTAL and G. HOOGENBOORN (2000): Genetic component of heat stress in dairy cattle, development of heat index function. J. Dairy Sci. 83, 2120-2125. 17. WHITAKER, D. A., W. J. GOODGER, M. GARCIA, B. M. A. O. PERERA and F. WITTWER (2000): Use of metabolic profiles in dairy cattle in tropical and subtropical countries on smallholder dairy farms. Prev. Vet. Med. 38, 119-131. During 2011, the impacts of two different dairy cow management systems (pasture-confinement and confinement-only), season and lactation on milk production and animal health was observed. Milk production and quality was estimated on the basis of the following parameters: daily production, fat content, protein, lactose, solids non-fat, somatic cells, indices of fat and protein, and the amount of urea in milk. Cattle raised in the pasture-confinement system (Farm 1) produced a significantly greater amount of milk than cows housed in a barn all year around (Farm 2). At Farm 1, milk yield was highest in summer, while on the Farm 2, it was highest in autumn. The content of milk fat, protein and non-fat dry matter was higher when milk production was lower (autumn) and vice versa. The content of milk fat and protein was lowest during summer. Significant differences between the two systems were also observed in the concentration of urea in milk. In the pasture-confinement system, the amount of urea was within the maximal normal values in spring and summer, i.e. during the pasture season, and decreased in autumn by 2.5 times. In the confinement-only system, no significant deviation in the concentration of urea in milk was observed. This study shows that in order to evaluate herd health and the sustainability of health and welfare of animals, regular monitoring of metabolic parameters is necessary in order to be able to estimate the health of animals on the herd and individual level.